The name of the new landing platform is a nod to “Experiencing A Significant Gravitas Shortfall,” a starship featured in the “Culture” science fiction novel series by the late Scottish author Iain M. Banks. SpaceX’s two other drone ships are also named for sentient, planet-sized ships in Banks’ novels: “Just Read the Instructions” currently based at the Port of Los Angeles for launches out of Vandenberg Air Force Base, California, and “Of Course I Still Love You” positioned at Port Canaveral for SpaceX missions from Florida. Musk wrote that “A Shortfall of Gravitas” will be stationed in Florida to support high flight rates of SpaceX’s Falcon 9 rocket, and allow for dual ocean landings of the two side boosters carried on the Falcon Heavy rocket. Falcon 9 rocket flights carrying heavy payloads, or missions heading into high orbits, must have their first stages land at sea. The boost required from the Falcon 9’s first stage for such missions leaves little leftover kerosene and liquid oxygen propellants for the maneuvers required to return the rocket to a landing pad on the coast. The Falcon Heavy’s most demanding missions could also require the rocket’s two side boosters, derived from Falcon 9 first stages, to land on ships downrange from the launch site. In such a case, the Falcon Heavy’s center core would use all its fuel to send the rocket’s payload toward space, and would not be recovered. By contrast, the two side boosters on the Falcon Heavy’s successful maiden flight Feb. 6 returned to Cape Canaveral landing pads shortly after liftoff. The center core attempted a landing on “Of Course I Still Love You” a few hundred miles east of Cape Canaveral in the Atlantic Ocean, but the rocket ran out of triethylaluminum-triethylborane (TEA-TEB), a chemical mix used to ignite the core stage’s Merlin engines. SpaceX’s two current landing platforms are towed into position downrange from Cape Canaveral or Vandenberg Air Force Base, then use automated underwater thrusters to hold position at preset GPS coordinates. Crews evacuate the drone ships ahead of the landings to monitor the rocket touchdowns from a nearby support vessel. The drone ships are each about the size of a football field, and they are based on Marmac barge hulls originally built for other purposes. The design of “A Shortfall of Gravtias” has not been revealed. A third drone ship will help ensure a landing vessel is always available to SpaceX for Florida missions. It can take up to a week to deploy the drone ship, recover the rocket and return it to port, and that assumes no launch delays. 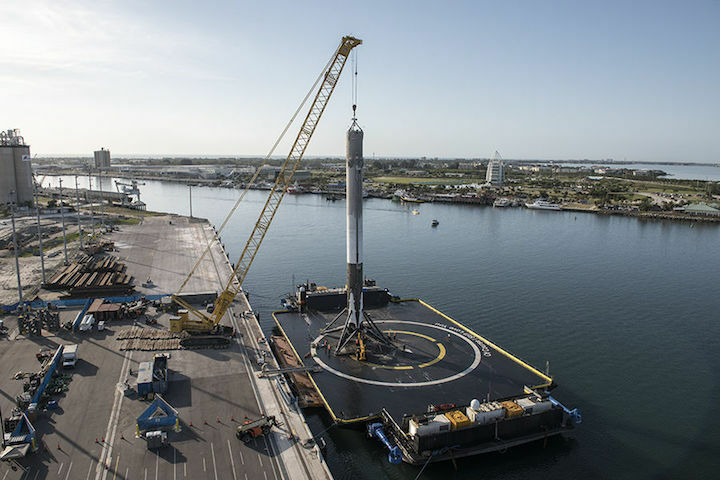 Turnaround times could be even longer once the booster is offloaded in port, and the vessel is prepared for another trip to sea. SpaceX has landed one of its rocket boosters intact on a drone ship 12 times in 18 attempts to date. The company is 11-for-11 in rocket recovery attempts on land, including the two Falcon Heavy side boosters that returned to Cape Canaveral after launch last week. The rocket landings allow SpaceX to recover, refurbish and reuse Falcon 9 and Falcon Heavy booster stages, a capability the company says will help reduce launch costs.